You might think that the recipe is time consuming and hard to prepare. Actually, the only tricky moment here is that you should put the peppers and the dried tomatoes in a bowl with water for couple of hours or overnight. And make sure to plan 30 minutes for baking the dish in the oven. Besides that, the stuffed peppers are relatively easy and fast to make. And the preparation time is totally worth as they are super tasty and also quite healthy. So what is more important than taking a good care of your menu and this way of your healthy lifestyle everyday? We thank Gabriela for the great recipe and pack our lunch bob with the freshly made stuffed peppers! 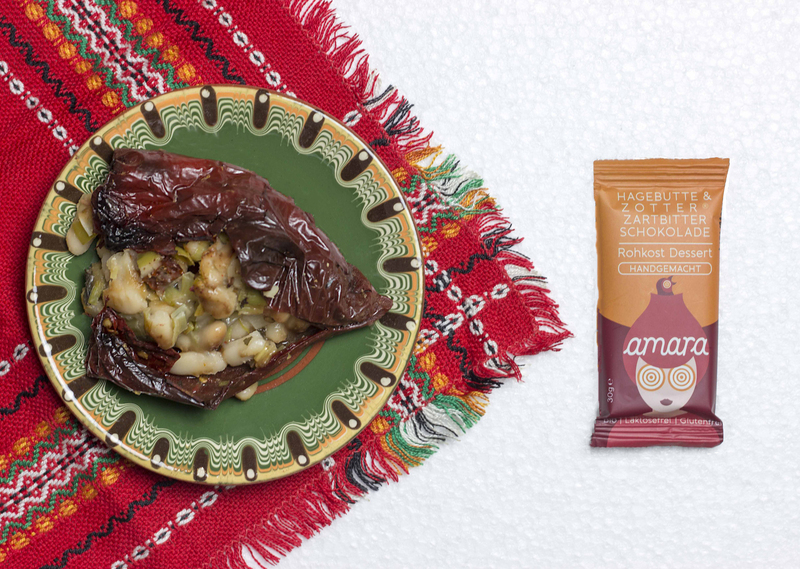 As quite big fans of the healthy desserts, we couldn’t forget to grab one or two amara bars – made by dried bio fruits and nuts and covered with a real bean-to-bar chocolate!